Consider the rotating magnetic field as equivalent to physical rotation of two stator poles N1 and S1. Consider an instant when two poles are at such a position where stator magnetic axis is vertical, along A-B as shown in the Fig. 1(a). At this instant, rotor poles are arbitrarily positioned as shown in the Fig. 1. At this instant, rotor is stationary and unlike poles will try to attract each other. Due to this rotor will be subjected to an instantaneous torque in anticlockwise direction as shown in the Fig. 1(a). Now stator poles are rotating very fast i.e. at a speed Ns r.p.m. 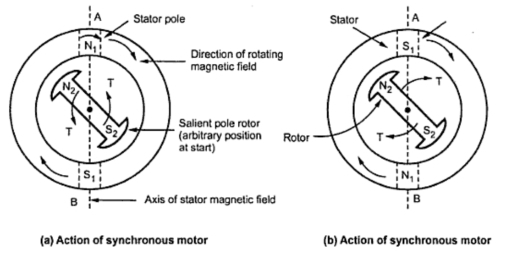 Due to inertia, before rotor hardly rotates in the direction of anticlockwise torque, to which it is subjected, the stator poles change their positions. Consider an instant half a period latter where stator poles are exactly reversed but due to inertia rotor is unable to rotate from its initial position. This is shown in the Fig. 1(b). At this instant, due to the unlike poles trying to attract each other, the rotor will be subjected to a torque in clockwise direction. This will tend to rotate rotor in the direction of rotating magnetic field. But before this happen, stator poles again change their position reversing the direction of the torque exerted on the rotor. Key Point : As a result, the average torque exerted on the rotor is zero. And hence the synchronous motor is not self starting. Note : The question is obvious that will happen if by chance the rotor position is in such a way that the unlike rotor and stator poles are facing each other ? But owing to the large inertia of the rotor, the rotor fails to rotate along with the stator poles. Hence again the difference of position of magnetic axes gets created and rotor gets subjected to quickly reversing torque. This is because the speed with which rotating magnetic field is rotating is so high that it is unable to rotate the rotor from its initial position, due to the inertia of the rotor. So under any case, whatever may be the starting position of the rotor, synchronous motor is not self starting.